257 (15 Oct 1944), 258, 259, 263, 264, 265, 267, 270, 272, 273, 274, 276, 278, 279, 280, 281, 282, 284, 285, 287, 288, 290, 291, 292, 293, 295, 297, 298A, 298B, 300, 302, 303, 307, 309, 310, 311 (3 Feb 1945). For Mission dates, targets and Mission Reports, see Combat Missions. B-17G 44-6517 (No name) 360BS (PU-F). - 1Lt Fink crew flew on 25 missions in this B-17. Aircraft flew on 82 combat missions and was sent to Kingman, AZ on 28 Nov 1945 for scrapping. 1Lt Marvin P. Fink (P) - Flew as CoPilot on mission 257, a combat orientation mission with the 1Lt Bertrand Hallum, Jr. Crew. Did not fly on mission 310. Combat tour completed on 3 Feb 1945. 2Lt Howard E. Reeves (CP). Stood down on mission 257. 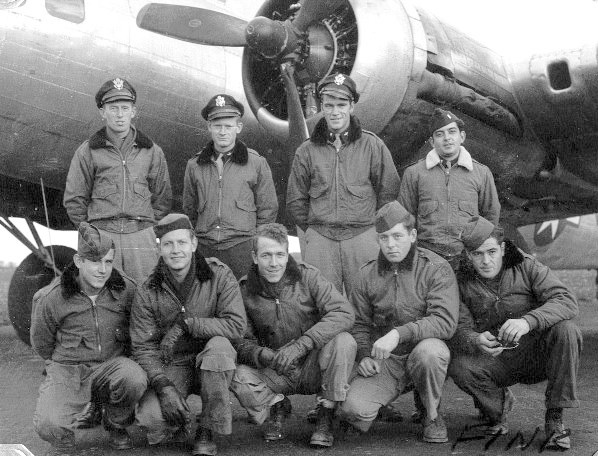 Did not fly with the Fink Crew on missions 258 and 303 where substitute CoPilots were utilized. Flew on mission 258 as CoPilot with the 1Lt Frank Juns Crew. Was upgraded from CoPilot to Pilot and flew on missions 303 and 310 as a First Pilot - mission 303 with some of the Fink crewmen. Combat tour completed on 3 Feb 1945. 2Lt Harry Subkowsky (N)(WIA) - Flew on 15 missions with 1Lt Fink - 257, 258, 259, 263, 264, 265, 267, 270, 272, 273, 274, 276, 278, 279, 280. Flew on missions 260 & 271 with other Pilots. Was seriously wounded on mission 280, 30 Nov 1944, to Leipzig/Seitz and removed from combat status. Substitute Navigators used on missions 281 & 282. 2Lt Robert Hand (B) flew as Navigator on the last 18 Lt Fink Crew missions. 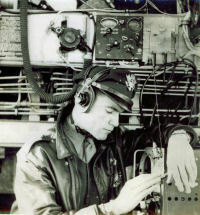 2Lt Robert A. Hand (B) - Stood down on mission 257. Flew as Bombardier on 16 Lt Fink Crew missions (258 through 282) and as Navigator the Lt Fink crew last 18 missions (284 through 311). Combat tour completed on 3 Feb 1945. T/Sgt Jack E. Holder (E), T/Sgt Robert F. Dahl (R), S/Sgt Richard M. Albright (BTG) and Sgt Cyprian "Tommy" Garcia (TG) - Flew on all of the 1Lt Fink missions except for mission 257 where they stood down. S/Sgt Albright flew as Waist Gunner on mission 307 and a substitute BTG was utilized.. Combat tours completed on 3 Feb 1945. S/Sgt Robert C. Peter (WG) - Flew on 29 missions with the 1Lt Fink Crew - 258 through 293, 297 through 300 and on missions 312 & 338 with other Pilots. Substitute Waist Gunners used on 6 missions 295, 302, 303, 309, 310 & 311. Combat tour completed on 17 March 1945. "Last Raid" - A Personal Account of the 303rd Bomb Group Participation in the Thousand- Plane raid on Berlin, 3 February 1945... and Other Stories. Story and Illustrations by Robert A. Hand, Sr., Capt (USAF (Ret), Bob Hand Design, 300 Meridale Drive, Johnson City, TN 37601, 1999, 8 1/2" x 11", 86 pages, soft color cover, with original drawings by Robert A. Hand.